Clemente State Park, and close by you locate tremendous locations like Hog Back. Bronx Kill is a fine local stream; dry warm beds await you at Days Inn Bronx-Yankee Stadium. The Harlem River Ecology Center is an urban nature center and micro-maritime museum, located at the southern end of Roberto Clemente State Park, NYC Bridge Park and River Park Towers. The entrance of the center faces the water, beneath building 10. This unique urban nature center offers weekly family programs, and school and afterschool fieldtrip programs on the weekdays with advance appointment. Every Saturday & Sunday in the Spring and Summer is FAMILY WALK-IN & KIDS DAY. Parents and Children can enjoy exhibit tours of a wonderful estuarium, aviary, and reptarium to discover and learn about the living nature of our urban estuary and urban watershed.� Another highlight is the center's micro-maritime museum. The modest museum offers a selection of modelships, underwater artifacts found beneath the urban estuary, prints and photography that celebrate a host a diverse heroes. 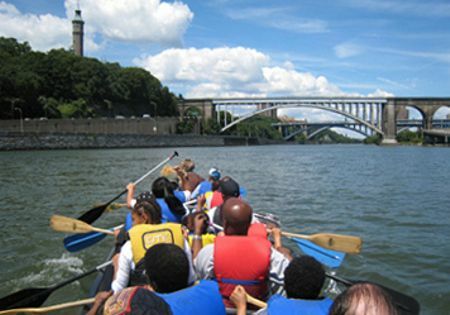 An seasonal guided ecocruises series offers participants a safe and convenient way to explore the Harlem River beginning in June. Ecocruises are held aboard the organizations strong and sturdy 32ft indian shipping canoe that accommodates 21 paddlers at a time. The Harlem River Ecology Center is conceived and established by The Urban Divers Estuary Conservancy ( UDEC). UDEC has served various communities in NY Harbor in envionmental education, community stewardship,conservation support and scientific diving, youth environmental leadership development and maritime cultural enrichment. These outdoors activities are available in and near Roberto Clemente State Park.